Metalphoto® is photosensitive anodized aluminum. Also referred to as photo anodized aluminum, Metalphoto has been the “go-to” option for durable labels, nameplates, equipments panels and more for more than fifty years. The Metalphoto silver halide image is permanently sealed within the anodic layer, making it virtually impervious to chemicals, heat, abrasion, salt spray and UV. Metalphoto meets an array of commercial, government and military specifications including MIL-STD-130N for Department of Defense UID data matrix bar code applications. Metalphoto photosensitive anodized aluminum combines extreme durability in harsh environments with a high-quality, long-lasting appearance. Metalphoto nameplates and panels function perfectly for years, maintaining their original appearance under an array of challenging conditions including extreme heat, humidity, long term exposure to weather, UV and other outdoor conditions, salt spray, abrasion, industrial solvents and chemicals and more. 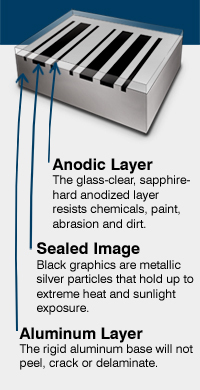 The durability for which Metalphoto is known is the result of a unique manufacturing process in which a silver halide image is embedded within the sapphire-hard, anodic layer of the aluminum. The National Association of Graphic and Product Identification Manufacturers (GPI) proclaims Metalphoto to be the most durable aluminum substrate; citing superior resistance to abrasion, heat and sunlight. For more than 50 years, Metalphoto has been the specified material of choice by engineers worldwide for durable labels, nameplates, equipments panels and more. Because of its ability to perform across a range of harsh environments, Metalphoto satisfies an equally wide ranging set of industrial, government and military specifications including MIL-STD-130N for Department of Defense UID data matrix bar code applications. Metalphoto has virtually no set-up requirements which makes it an excellent material choice for short and medium run production requirements or when a large volume of unique or one-of-a-kind parts are required. 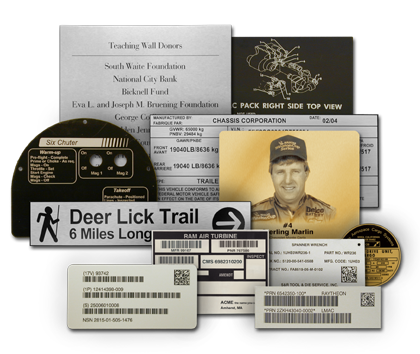 Metalphoto panels, nameplates and labels may be produced quickly and economically. From prototypes and one-of-a-kind type jobs to extended and on-going production requirements, Metalphoto can meet many of your needs without costly set-up and production charges. Sizes: 10″ x 12″, 12″ x 20, 20″ x 24″, 20″ x 40″,24″ x 40″. Spec or Custom Size Sheets Also Available. Performance Characteristics:Extremely Durable; Resistant to Chemicals, Abrasion, High Heat, UV, Outdoor Weathering. The most durable of aluminum identification plates, Metalphoto is available in a range of thicknesses and finishes. Specific thicknesses include .003″, .005″, .008″, .012″, .020″, .032″, .039″, .063″, .090″ and .125″. The table below is offered to provide the reader with a visual or graphic representation of the available thicknesses from .012″ to .125″. Thinner gauges (.003″, .005″ .008″) are not depicted due to the limits of computer monitors. Please contact us to discuss your application or to receive thickness sample chips.